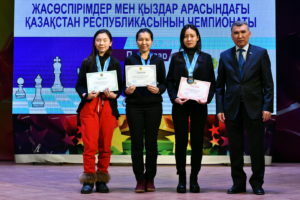 U18 Kazakhstan Championship of classic, rapid and blitz chess in Pavlodar has finished. 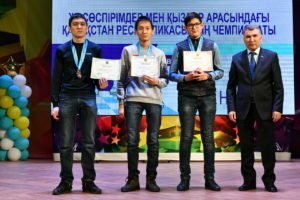 Assel Serikbay of Kyzylorda and Ramazan Zhalmakhanov of Almaty were victorious in the classical format in the senior age group. Apart from money prize, they were qualified for the World Junior Championship scheduled for October in Nagpur, India. Chingizkhan Sarzhanov and Nazerke Nurgali won the U16 classics. Sultan Amanzhol and Meruyert Kamalidenova were the best in U14. Ayat Abdullayev and Aysha Zakirova finished strongest in U12. Edgar Mamedov and Elnaz Kaliakhmet succeeded in U10. Dinmukhammed Tuledinov and Aylin Zarkym had the victory in U8. Dastan Bakytbek and Aylin Alemanova won the gold medals in U6. “Kazakhstan Championship always gathers the strongest chess players, the best of whom get the privilege to represent Kazakhstan in the international arena, – says Dastan Kapayev, national trainer of the Republic of Kazakhstan. We are especially delighted by the fact that national chess is being refilled with new young people every year and it has been two years now since children under 6 are taking part in the republican competitions. Initially, this was launched as an experiment, which has obviously succeeded by far”. 640 young players aged between 6 to 18 competed in this championship for the total prize fund of KZT 2 million. Winners of classic gold and silver medals were qualified for the 2019 World and Asian Championships respectively. Bronze medallists received a priority right to compete in the Western Asia Junior Championship. General Partner of KCF is Samruk Kazyna NWF JSC, Social Partner is Samruk-Kazyna Trust Social Project Development Fund. General Sponsor of Kazakhstan Chess Federation is Shakhmardan Yessenov Science and Education Foundation.